All your sci-fi dreams of being able to talk to your gadgets and have the do your bidding are slowly becoming a reality. 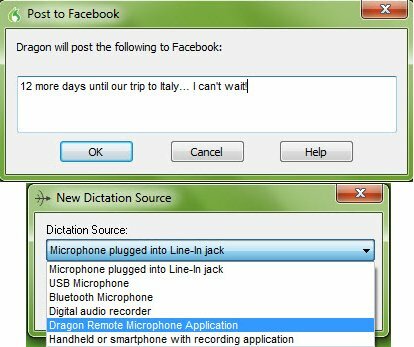 Nuance, the company behind Dragon NaturallySpeaking, has been at the forefront of the technology since 1997 and, with the release of 11.5, it has added a few neat tricks to its dictation-taking repertoire. On the desktop side, new widgets allow you to post updates to your Facebook and Twitter accounts simply by saying "post to" you social network of choice before spouting off your status update -- perfect for drunk tweeting when those beer goggles make it hard to hit the keys. Nuance also released the Dragon Remote Mic App for iOS, which turns your Apple device into a wireless mic that beams commands and dictated notes straight to your PC. We're pretty excited for all this voice controlstuff -- so long as our computers don't start refusing our requests in a detached monotone. Check out the PR after the break.